If you are looking for quickly and high quality ELO boosting in League of Legends, you have got the right place. 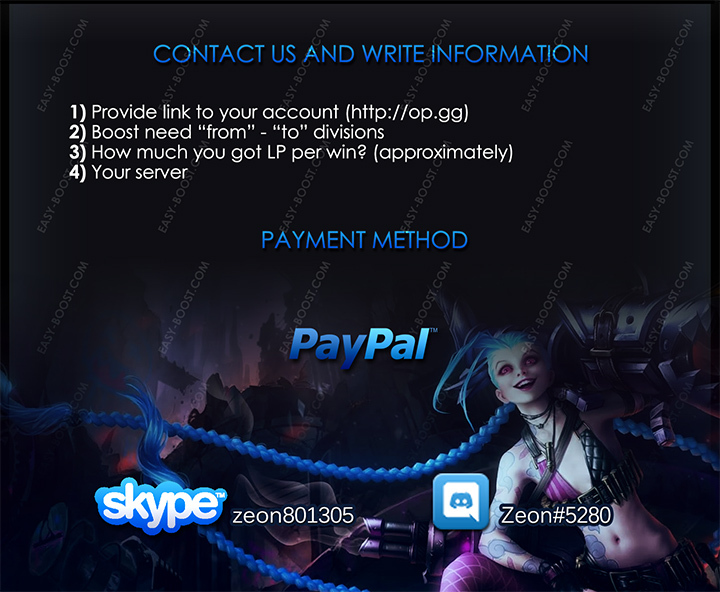 For a very small amount we can boost your «Ranked» to your desired division and league. So, let us tell you how it works! It's simple. Our people are professional players in the League of Legends, they have a "Master Tier" league on server EU West, they thoroughly know any trivia, secrets, and have the necessary knowledge of the game to pull the team from any situation, without offending anyone in a chat. If you want to make sure by yourself, you're always allowed and welcome to see how we're boosting your account by using "spectate mode". At the moment, our service is the leader at the Russian market, we have been working for over a four years and have an excellent reputation, also, we have lots of positive reviews. Now we are expanding our services and will boost people around the world. All information and links we can provide you if necessary. Choosing our service - you get the quickly boosting to any division and the league, for a very low price. We believe that our competitors are strongly overestimate the price for similar services. Approximate dates elo boosting - one division per day (or faster). At the moment, we are working in the field of boost accounts in the Leаgue of Legends more than four years! We have a lot of positive feedback about our service. • When choosing our service - you get the fastest boosting to any division and the league, for a very low price. We believe that our competitors are strongly overestimate the price for similar services. • We do our work is absolutely confidential, none of your friends and relatives will not know that you enjoyed the service "elo-boost". Complete privacy in the game, and after boosting. • We are professionals in their field, and have been working for quite a long time, have a good reputation and a lot of positive feedback. • As a rule, after the order of payment we will immediately proceed to its implementation. Many services and individuals begin only every other day, or in their spare time, making the game 1-3 in the day. We are, as a rule, are starting to make the order directly, and play a lot. • We work seven days a week - please contact us at any time, any day of the week. • As long as the order is not executed in full - we ask you not to go to your account, and did not interfere with our man. In case of violation of this rule, we may require an additional charge. • If you gain less than 18 LP per game, you will need to pay a bit more. • We accept payment by PayPal. Payments via PayPal will come as gift from countries where this is possible. • We are not liable for the account after \ during magnification. We guarantee quality work in a short time, with maximum security for your account, but is not responsible for follow-up action on the part of the administration server. Although over time (over four years) that we work not yet had any major problems. • No one is protected from emergencies, so I do not give a 100% guarantee of compliance with the order within the period agreed upon with the customer, in case of violation of terms of delivery of the order, we may require an additional wait for a while. 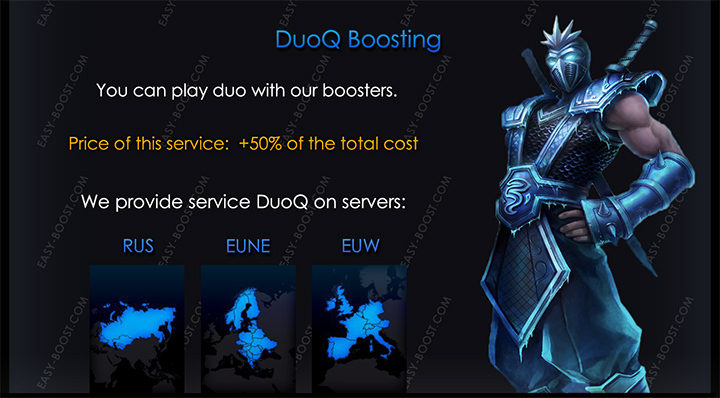 • In the case of games in the duoQ - the customer must provide an additional account for our booster. In rare cases, we can play with our accounts in duoQ. And also, the customer should be able to play at a sufficient level in rank (ELO), to which it is necessary to boost. If it turns out during the game client plays bad - to boost time can be increased. • If during the boost your account has been lowered by -1 division - we pump out its own expense. Do not worry, because sometimes come across trolls and feeders to the team. This is normal. • Within 24 hours of the order, if for any reason your order is not yet started - you can request a refund of money. If we have started to your order and took more than 24 hours from the time of payment - we will do it. In this case the money back we do not refund. You will need to wait until the end of the eloboost. • We use a VPN for the client, if necessary. In our state of many employees, they all live in different parts of the world. If necessary, we can choose the person to your preferences by country. The first three of our customers, we are willing to make allowances for all divisions. Best price and quality here , i recommended hard ! Very fast and easy. Definitely recommend! everything went smooth, fast and trusted. These guys are pretty legit, not gonna lie, they don't speak english well but... oh boy, they do get the job done. I was worried at first, but these guys were on point, good price and fair speed on boost. Just got a p4->d5 boost, amazing prices, fast service and efficient team ! The manager is very pro and listen to you during all the boost. 100% Trust I really recommend this guys ! Great sellers, Fast delivery and the manager is a really good guy! I recommend them! Prompt service and quick to get to action. Finished my job in 3 days. Would recommend and they offer great prices. Ordered g1 - d5 duoQ and we had a lot of fun! The booster was very skilled and friendly Order was finished within a week.